Sound work progresses nicely on THE WHOLE TRUTH. Now that the color correction is completed, it's time to dedicate our attention on all the sound effects, dialogue and music. Lots of filmmakers believe that "too much" background sound interferes with the audience's attention to dialogue, I believe all that sound makes you feel like you're right in the scene with the characters. We have to be cautious to make certain what should be sublime and hinted remain that way and not too loud, distracting us from the dialogue, but sound can also work as a comment on what's happening, clue you in on what's coming up, give a special tone to layer the scene and lend all sorts of character to a scene - in some cases, certain sounds and music become characters themselves in a film. That's definitely true of TWT. In LA, I had a terrific, insightful time working with the leads of our third feature, another screwball comedy (but much smaller a production than THE LONELY GOATHERD). I have a basic outline of the logical story and psychological profiles of both leads, so the discussion revolved around how these people came to behave in the way they do as dysfunctional adults and parents. Being the pro's they are, they came up with all sorts of terrific ideas - and that's all I sought. Ideas coming from the people who will portray the characters. As I left, one of the actors told me that the few times he has worked with a director this way, he received the most major awards and nominations to which an actor can aspire. Gulp! My work is cut out for me! Thanks to the invitation from a very generous friend, I attended THE L-WORD wrap party, where I had the opportunity to meet several cast members, crew, and actors who have guest-starred over the past few years of the Showtime program. 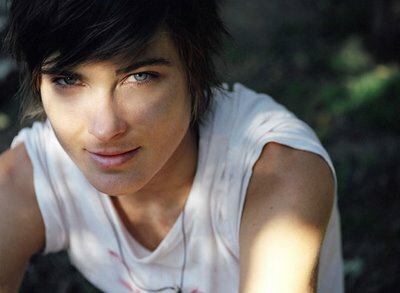 Daniela Sea, who plays transsexual Max Sweeney on the show, told me she is spearheading a DVD project dedicated to the memory of thousands who have been killed because they are gay (or believed to be) - she will be telling the personal story of each victim. According to Daniela, the group with whom she is working has some pretty grim statistics - like every nine days someone *believed* to be gay (whether they are or not) is killed. Hopefully her project will raise awareness and help stop this lamentable lethal legacy. I'll let you know when the DVD is ready and where to buy it if you'd care to support the educational effort to promote understanding and awareness of a history long overlooked. She is so enthusiastic about the project, I have no doubt it will receive the respect and notoriety it deserves. Daniela and the brilliant Leisha Hailey ("Alice") are the only two "out" lesbian actors in the large cast of gorgeous women portraying lesbians in THE L-WORD. Meanwhile, in the Venice neighborhood (which is quite extensive and extremely diverse), I took the opportunity to hang out with a dear friend and her 10-month baby (my honorary "niece" so of course I had to come bearing gifts), which was lots of fun. One thing about babies and animals - they let you know how they feel about you for no other reason than .. well, that's just the way they feel. Fortunately, she takes a shine to me - I'm *positive* the toys I brought have *nothing* to do with how she feels! I did not bring anything for the dog they are fostering, however, but he obviously smelled my three dogs and kitty on me and decided I was O-K! I also met with our LA casting agent Rick Pagano - one of the all-time good folks in the business and superb at his trade; and had a leisurely breakfast with our editor Stephen Meyers, and fine actor in THE WHOLE TRUTH, Jim Holmes. All this took place within two days, arriving back home early Wednesday morning when my assistant Aaron dashed me over to Bad Animals Studio to continue our sound mixing! I'm on to shot-sheeting THE LONELY GOATHERD. This is a tedious, time-consuming, detailed task wherein I (as director) list every shot I have in mind for the entire script, scene by scene. I'll refine this at least one more time from beginning to end before meeting with the Director of Photography to share my ideas and then refine it again, incorporating both our ideas. Then we create whatever inspiration the actual set, scene and actors provide while we are in full-tilt production shooting, using whatever ideas still work from the shot sheet. The shot sheet is basically a plan so I can create all the pieces of the visual and sound puzzle that I must put together to form the complete film. As we shoot parts of scenes, I "edit" them in my mind, so I know how the film will look when it is completed as I go to work with our superb editor, Stephen Meyers. One reason to work with an editor at the script stage - while I'm writing the script, before any preproduction - is to get good ideas for special shots and "cutaways," or details of a scene or character that may not seem apparent but that would cut in nicely for the edited film. Stephen gives me a list of them, which I pass on to the DP, making sure we catch them as we are in production. Writing that list is what Stephen is doing in LA as I create shot sheets in Seattle! When will you start production on your Goat movie? Sounds like you are keeping really busy. And we'll button a start date for the "Goat movie" as soon as we complete post production on The Whole Truth - if not earlier. Believe me, a *lot* of people are waiting eagerly for us to get started! Including me!